My daughter makes this yummy dessert recipe. With the holidays very soon upon us, this is one recipe you will want to try. This is almost like a pumpkin pie cobbler. Serve it warm from the oven with a scoop of vanilla ice cream. How could I forget to show you the Polka Dots?? I realized after I had posted my picture of Madeline for the Bloggers Quilt Festival that I left off a picture of the full quilt. And Madeline is residing in the Living Room on the sofa. In the spring of 2009, I participated in the first Bloggers' Quilt Festival, hosted by Amy's Creative Side. It's become a tradition to enter a quilt among the hundreds of other amazing entries. While the Quilting World is at Quilt Market, Amy gave us a way to enjoy a few days of quilt gazing. I also want to thank crazyMomquilts Amanda Jean for her Finish It Up Friday challenge and the incentive to "Get them done!" This Schnibbles pattern was one I made and never quilted. So this week my goal was to quilt Madeline, and finish this quilt. I don't like to mark my quilts, so I do most of my quilting with a walking foot. You know what's coming tomorrow?? I don't think you'll want to miss this semi-annual event. It's a great way to meet up with old friends and find new blogs along the way. but I'm just not ready for this! Irons have become the subject of much controversy, and in some cases fury. So what can I add that would be of any help?? which ever Iron has crossed your path, as quilters we've found the need for our Iron of choice to be dependable. I came across an article in a recent Machine Quilting Unlimited magazine that I thought was worth sharing. It was an Iron Buyers Guide, and while I cannot copy the whole article (I'm sure you can obtain a copy of the Sept/Oct 2001 issue), the subject of water leakage jumped out at me. Did you know that the most common cause of water leakage is not allowing the iron to heat up fully before use? I know sometimes it is difficult to wait, but don't start pressing until you are sure the iron is hot and the reservoir has built up a head of steam. Also, turn the steam button to OFF when refilling. If it is on, the iron will try to create steam immediately and the cold water will cause leakage. The article was very informative and well written. The author was Vicki Anderson. There were several irons featured that were steam, dry and craft irons. As for my own iron, I chose to never put water in my iron. I keep a spray bottle by my ironing board and just spritz whenever I need it. Whether quilting or pressing clothes, I give my iron a pretty good workout and I've been very happy with the results. So much so, that my iron has lasted over 10 years. I learned a lot from the Iron Buyers Guide. Reliability, longevity and consistent heat are some of the key factors to choosing an iron. I hope you find an iron that fulfills your ironing needs. It looks like Christmas is coming, whether I am ready or not. Do you feel more pressure to get things done when you realize that Christmas is only 9 weeks away?? I'm trying to get my ducks in a row and work on things that are to be Christmas gifts. I wish you could see the black blender fabric on this quilt. It looks like lace and looks very pretty with this rose fabric. I plan to use black batting to keep the unity of the quilt in case of bearding. We've had a little bit of a cold snap here. Down in the 50's in the evenings. We even had a leaf or two that showed a little bit of color. It's got to get a lot colder before we lose these pretties. Last year when I had a back injury, Kelly from I Have A Notion sent me a very cute Landscape pattern with some coordinating fabric. As I could not do much quilting, it was a good project for me to work on as I felt up to it. and started machine quilting the details of the Landscape. I now have a completed Fall landscape quilt hanging on the wall. I would love to make one for Spring and Summer to change out with the seasons. When you enter a quilt shop that has so many beautiful fabrics, it is pretty near impossible to leave without bringing something home with you. And I was able to finish a Baby quilt that was destined to be a gift this week. My BFF has returned to the cold north, but we so enjoyed our few days of girlfriend time. I am back from Girlfriend land :-) How fun it is to have time to spend with your BFF, especially when she lives over 1000 miles away. It's just sad that we did not have more days to spend together. I drove down to Naples to pick her up from her parents condo. There is such a beautiful view of the woods from the condo. My friends sweet Mom took us all out to a delightful English Tea room. How fun to enjoy a girly Tea/Lunch in such a beautiful place. And then we headed north, but you know what?? It did not take nearly as long for us to drive back as it did for me to drive down. I wonder why that is??? I've shared with you about my little Featherweight sewing machine and how she came to live with me. This week, as I was working on a little flannel baby quilt, I wanted to share with your about another little work horse. Little Miss Kenmore has a story of her own. When my children were still very little, there was not much time for sewing quilts or anything else. But when I started quilting, I was sewing on a Singer Stylist machine I had bought when I graduated from High School. The Singer was always a little difficult and gave me so many hours of trouble, that it just wasn't worth my time using it. Whenever the repair man was called, the machine always seemed to have a problem with one of two parts, which the repair man told me were the only plastic parts in the whole machine. So when I started quilting I ached for another machine that would be more user friendly. As we were leaving church one Sunday morning, my children and I were talking about sewing, and I mentioned that the only way that I could get a new machine is if the Lord would bring it to me. So to my surprise, one of the older ladies from our church called me that week and offered me her sewing machine. She had bought a new one, and as her own daughter did not need one, she wondered if I would like to have it. BOY would I!!! Apparently she had overheard us talking as we were leaving the building on Sunday and knew that I could use her machine. Little Miss Kenmore has sewn miles and miles for me. She has never needed repair, and has always been ready on the spot whenever I needed her. When my hubby bought the Bernina for me 8 years ago, Little Miss Kenmore went into retirement. I had her serviced and cleaned so she would be nice and clean. I've used her a few times, like this week when I am sewing with flannel, and other times when she was more accessible then the Big Baby Bernina. Little Miss Kenmore has been a faithful and loyal servant for my sewing needs. As a matter of fact, I loved her so much that I bought another Kenmore for my daughter when I found one at the Thrift store for $20. It's always good to have a dependable back up machine. Do you have more then one sewing machine?? Do you have a story to share?? The Singer website takes the serial number from your pre-1970 Singer Machines and produces a certificate for you to print. Your Singer sewing machine has a story to tell! and she was born in 1940! And you can find MY story HERE. I love using my Shape Cut slotted ruler. It makes cutting much more accurate (at least for me) plus I can make several cuts at one time. So I decided to make a Fall Leaf Garland. And thought I'd share with you how I made it. Sew around the edges of the sandwiched leaf. Now cut around the edges of the leaf. I know this is probably a pretty basic way to do this, but I wanted to show you how I made the free form leaf and how it is attached to the string. Making it two sided allows you to use the garland where both sides are finished. Thanks for taking the time to view this little tutorial. 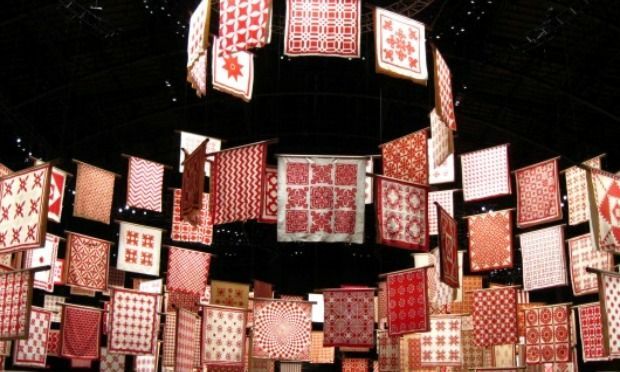 Remember the magnificent Red and White Quilt show in New York City just a few months ago?? 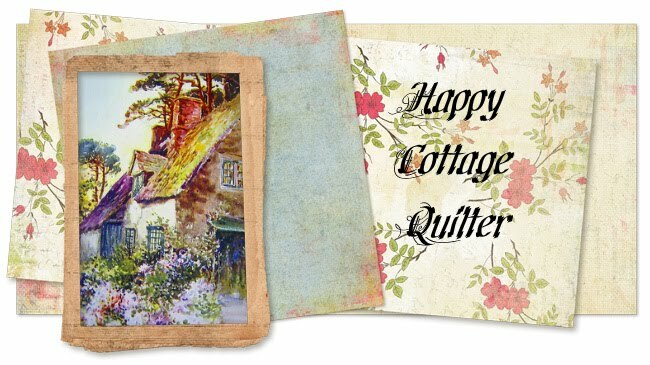 Take a look at the Temicula Quilt Co blog for a beautiful quilt show in a Quilt Shop. Sue Abrey has a new book published called Pick Four. I hopped along the blog hop and recently was awarded a copy of Sue's book. So you can imagine my excitement when a package arrived at my doorstep all the way from the UK! And one thing I immediately liked about this quilt book is the color options. I always struggle with picking colors for a new quilt, and seeing the quilt made up in different color ways is such a huge help for me. Thanks Sue! I know I am going to enjoy making these quilts! Good Monday Morning and Winners!! !